I'll be editing to make this a more organized list as I go... Just want to show I was making the effort. This will be no small task as I have decided to go through every model and year I can find to give you specific part numbers for BOTH Rubber/Poly bushings as well as kits and various other parts still available for these cars. I have also started a canvas of the major chain part stores for their remaining part numbers. All will be listed here. If you find anything in the meantime that I have not seen or used.... please either PM it to me or post it here. So far... This is all I have organized besides the massive amount of info from the major chain stores. As well as the several links I have not been able to sift through yet. Poly Bushings DOT Com specializes in FWD cars, they do have universal polyurethane bushings listed by dimension. You can measure for your application and order them one at a time. Energy Suspension DOT Com makes many kits and parts for a lot of cars and trucks... except AMC. What they DO have however is an extensive amount of universal parts and pieces in POLYURETHANE. WSC Motorsports has polyurethane kits for control arms as well as strut rods, sway bars, and torque arms. Listed on that page link are a suspension kit and a rear disc kit for the AMC 20 axle. Scroll down to find the bushings part listings. American Parts Depot DOT Com has a wide variety of suspension parts listed for many models. The list is almost endless and it takes a VERY LONG TIME to go through it. You can also contact them for specific questions. One of the things they offer are trunnion exchanges with rubber or poly bushings. Galvin’s AMC Rambler Parts has a wide variety of suspension bushings and parts listed for many models and years. Again…. 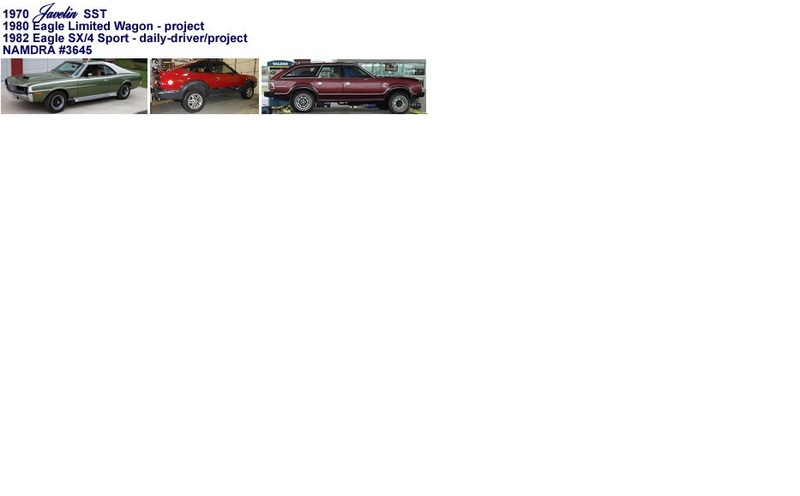 Almost an endless list of things so here is a link to the vehicle page so you can see what they offer. Performance American Style DOT Com sells Prothane Polyurethane Bushing Kits for several makes and models as well as rubber bushing kits..
HARD PARTS - Bolts, etc. P-S-T DOT Com sells "complete" front end kits using POLYGRAPHITE bushings. They are available for the model ranges listed. Old Car Parts DOT Com otherwise known as American Performance. They sell all kinds of parts but as of late their online catalog is down. If someone knows the suspension part numbers I'd be glad to list them!! AM Racing DOT Com has various parts for sale but as of late the pictures on their website do not show up. Could be my problem so if anyone has listings for them I'd be happy to add. Anyone else think of anything? they have the spring support bushings for sure. Anyone try to find numbers for the urethane tie rod boots? When you google "urethane tierod boots" so many come up that I would not know where to start! Which ones fit what the best? I'll try and remember to look at the linkage; I have both a 65 Ambo and a 68 American setup out of the car. I had a 73 Hornet setup, but I think I let it get away in the scrap purge I just did. None came in my Prothane "complete" kit. Rare Parts are available from O'Reilly/Autozone/Advance Auto/Napa...... Depending on the part number you may not even know you are getting them. I've been searching high and low for specialized dealers in rubber and poly parts. Seems that the only way to get our specific parts out there is through subsidization. As for the tie rod end boots... I'll seea bout a link for some listings. Urethane Tie Rod Boot info Menace posted, Tie Rod Boots he used on a '70 which I reckon are the same as a '69. Looked up dimensions and interchange. Have yet to get and install on a 1969 AMX. I rebuilt my entire front end on my 73 from NAPA. They had everything! Will the Prothane trunion bushing for 64 to 69 fit my 56 Nash Rambler?? ?